Respiratory failure can be the result of impairment in the central control of respiration, neuromuscular disorders or due to intrinsic lung problems. In the neuromuscular causes of respiratory failure, several factors like upper airway problems, inspiratory/expiratory muscle weakness, low tidal volumes, etc. can be contributory. Features like rapid shallow breathing, use of accessory muscles of respiration, cough after swallowing, and paradoxical breathing point towards the possibility of impending respiratory failure. For physicians treating neuromuscular disorders, identification of early signs of impending respiratory failure is crucial for better patient outcomes. 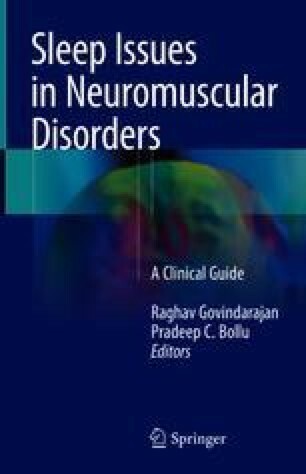 In this chapter, we review the physiology and pathology of respiration in the setting of neuromuscular disorders along with objective assessment of respiratory failure.